I've discovered I love powerfull diesel engines, so I've decided to make some of them. I start with the german diesel engine Vossloh G2000 "ACT". It's a long vehicle (length=12) with 2700 kw, 86 tn and a running cost of 17cr. Another diesel engine, this time from UK. It's British Rail Class 40 D200. It's a long engine (it takes a single square) with 1490 kw of power, 140 km/h max. speed, 135 tn from 1958 to 1987. I'm finishing a set of USA GE Dash 8-40C Diesel engines with different liveries. Will you code them to appear in the usual US arrangement? Oh, wait! I've been toying around, they're very nice! You've got to introduce me to your 3d to pixel methods. Doing that test makes me wonder if diagonal (NE, NW, SE and SW) lengths have been corrected. Well, it doesn't really, it shows! :·) No more 3d distorting to get right sizes! Well, I tried to use the right scale but as you have pointed out, in real life the engines are pretty large, thus I guess I will code them with a length of 11 units. IRRC, the previous engines are coded with the same length, too. No, I think I expressed myself badly here, sorry. That diesel there is overlapping itself, that diesel was made by me a looong time ago, with a distorted (elongated) side view so that there would be no gaps between wagons. 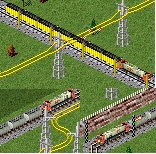 This was because on diagonal tracks trains where (inside the game) longer than they should. Now it would seem that this is corrected, so nothing to worry about. The set of USA GE Dash 8-40C Diesel engines is finished and ready for downloading. Love 'em all. Just wanna see the whole set runnin together(y locos in one piece). & if u r planin to do so, please keep the same costs. The Devloper from those projekt have his last useing on the 22 November 2012. Whatever maybe the case, the locos are just too powerful, and awesome!